These three are ohhh so adorable! Talk about well behaved! The older two waited patiently as i took pictures of their little brother. He was teething something awful. You would have never known it accept he was gnawing on that tiny fist of his. TOO cute and He was such a happy baby! Big Sister and Big Brother did an excellent job of holding little man up. 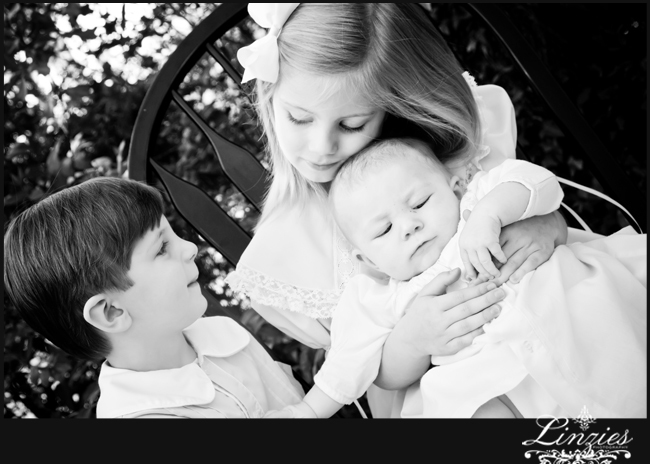 It is hard to pose a newborn with younger children BUT they did a great job. I was actually honored that they did not want to leave my home. ( even though it was due, in part, to all the toys ; ) Yall are welcome back any time!!! I don't think momma was too crazy about the pink nail polish, but it adds so much realness and true life to this image!